Before I organized our small laundry room, the ironing board was jammed on the side of the washing machine with brooms and mops. Oh, and I think a step stool was in the mix too! So every time I needed to get the ironing board out, it caused an avalanche of brooms, mops, and step stool to come tumbling out. I quickly realized that I needed some laundry room organization ideas for my ironing board STAT! When we got our new washing machine and dryer, I knew it was the perfect time to tackle organizing the laundry room and find a permanent and safe “home” for our ironing board. I needed to be able to easily access the ironing board quickly because I ALWAYS wait until the last minute to get something ironed and ready to wear. 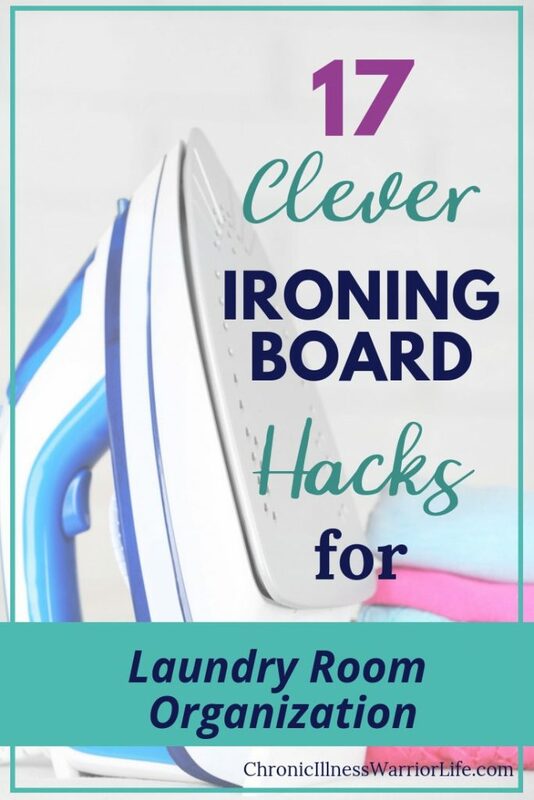 As I was researching ways to organize our laundry room, and especially ironing board storage and organization I found some very clever products that would do a fantastic job. I was pleasantly surprised that there are tons of products on the market that give you options of hidden, wall mount, over-the-door, and freestanding ironing board storage solutions. Depending on your laundry room layout and size, you will find laundry organization ironing board products that will fit your needs. And with a little DIY customization, you can make your laundry room look pretty too! This is a phenomenal way to use the vanity drawer in your bathroom. These drawers have a unique width and depth that most bathroom drawers don’t have. So it’s great to be able to make use of the particular dimensions. I know my vanity drawer is stuffed with things that could easily go in other bathroom drawers or under-the-sink storage. This one is in my laundry room and I love it. I don’t have room for any of these other cool ironing board storage options. It is simple and allows me to hang the ironing board on the wall in that same space I talked about earlier next to my washing machine. Then, I can still put my mops and brooms too. Simple but functional. It only holds your iron and has a protective piece that separates the iron and the wall so that you can store your iron right after use even before it has cooled down. This is a great option that you can attach on the wall behind the door (as long as you can attach it to the studs in your wall). If you have a nice heavy door you could attach it to that, but in our house we have the hollow wood doors. And also if you do have nice doors you may not want to drill into them. The plastic surface on this wall mount ironing board storage solution will protect your wall from the heat if you store your iron right after use. I like the upside down design for storing your iron because it makes storing the cord easier. I find that when the iron is stored right-side-up, you are often trying to “stuff” the cord inside the organizer. Perfect for small spaces plus you can store iron and supplies inside cabinet. It is solid wood construction which you don’t find often these days. This cute white wicker ironing board storage option comes in two adorable prints. The “Literary” is shown, but is also comes in a fun Hawaiian print as well. I love how this laundry sorter and ironing board can go wherever you go and it can be also used as a folding station. The ironing board lifts up for easy access to remove laundry from the sorter. This free-standing ironing board storage center is TOTALLY collapsible and has very important parts-hook/hanger for finished clothing and a place to set the iron. Amazing functional space-saver! If you have sturdy heavy doors, this could be a good option for you. We have the hollow wood doors in our house (builder grade “F” in my opinion) so heavy objects hung on doors make the swing pretty hard into our walls. I love the extra storage to keep starch right alongside of the iron so that I don’t have to go chasing it down each time I need to iron. Simple and great if you have depth behind the door because the iron will stick out a bit. This one has nice bronze and brushed chrome color options. So if the hardware in your laundry room is more modern, this ironing board storage basket will compliment your laundry room style. There are so many options for ironing board storage for your laundry room organization project that you are sure to find one that fits your needs. These great ideas of ways to store your ironing board and create a functional ironing board station shows that you are not just limited to your laundry room. Being able to take your ironing board storage to different rooms in your house is extremely helpful. Many of these laundry room organization ideas for your ironing board also allow for accommodations for people who have disabilities or a chronic illness which makes it hard to stand for long periods of time. I know with my chronic back pain, I need to be able to sit down while I iron. And let’s be honest, I don’t know many people who enjoy ironing. Do you? So being able to bring my ironing station to a room with a TV helps make this much disliked chore a little more bearable! P.S. If you like these 17 laundry Room organization Ideas for your ironing board, would you do me a favor and Pin this for later? i sure appreciate it!